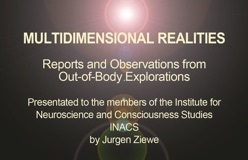 Jurgen Ziewe reports about his peak experiences which gradually lead towards a state of consciousness of direct reality awareness without the filters of conditioning, prejudgements, the likes and dislikes of the ego. 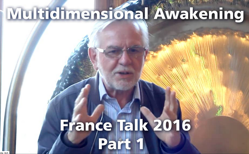 He delves into the phenomena of "Awakening", what it "feels" like and how it differentiates from normal everyday waking consciousness. There is a state of consciousness which is shrouded in mystery. It has inspired the greatest religious leaders of all time and is at the root of most religious beliefs. It has been referred to as Heaven, where the righteous reside in eternal peace. Does it exist or is it just a fantasy. If it does what does it look like? Reports and Observations from Out-of-Body Explorations. 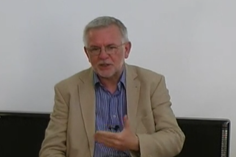 A presentation over Skype to the Institute of Neuroscience and Consciousness Studies. 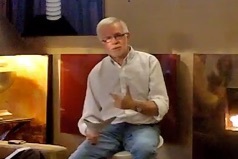 "The video summarizes a one week adventure into consciousness, a process of prolonged and intense meditation in a remote mountain cabin, which was chronicled in my new book "THE TEN MINUTE MOMENT"
The author talks about the different level of consciousness and the corresponding dimensions and about the training he received from a guide on a higher dimensional level, which enabled him to enter a new super dimensional reality. 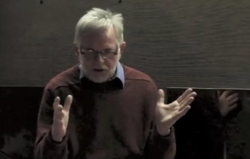 The author talks about a spontaneous enlightenment experience, which was the precursor to a lifetime of out-of-body experiences, chronicled in his book "Multidimensional Man". 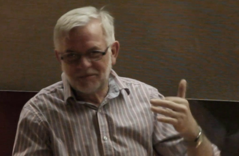 EBTV with host Evita Ochel and featured guest Jurgen Ziewe in a dialogue about Jurgen's work with multidimensional reality, including out-of-body experiences and life after death. 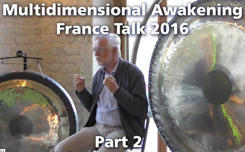 5 - How does awakening inform our action?